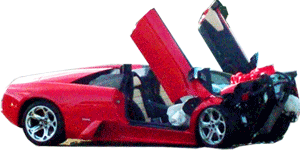 One of only 4 Murcielago SVs in Indonesia has now crashed. Driver walked away from the crash. Lamborghini Murcielago LP 670-4 SV. Happened in Indonesia.